NATO tells tales of recently launched “Scud missiles” to retroactively justify Patriot missile deployment months in the making. As this threat’s credibility diminishes, NATO has retroactively justified their November decision with a new tale of “Scud missiles” landing “fairly close” to the Turkish border, according to Reuters. Within the same report, “Scud missiles” would be downgraded to “Scud-style ballistic missiles,” in what appears to be immediate backpedaling that casts doubt on the entire narrative. Syria has denied the accusations, and in response, no evidence has been provided by NATO, with the claims emanating apparently from unnamed “US officials” claiming to cite undisclosed “intelligence information.” It is very likely that more fabricated incidents will be announced as the missiles are put into position. In addition, Israel’s intelligence services have a strong knowledge of Syria, as well as assets within the Syrian regime that could be used to subvert the regime’s power base and press for Asad’s removal. Israel could posture forces on or near the Golan Heights and, in so doing, might divert regime forces from suppressing the opposition. This posture may conjure fears in the Asad regime of a multi-front war, particularly if Turkey is willing to do the same on its border and if the Syrian opposition is being fed a steady diet of arms and training. Such a mobilization could perhaps persuade Syria’s military leadership to oust Asad in order to preserve itself. Advocates argue this additional pressure could tip the balance against Asad inside Syria, if other forces were aligned properly. –(page 6), Assessing Options for Regime Change, Brookings Institution. 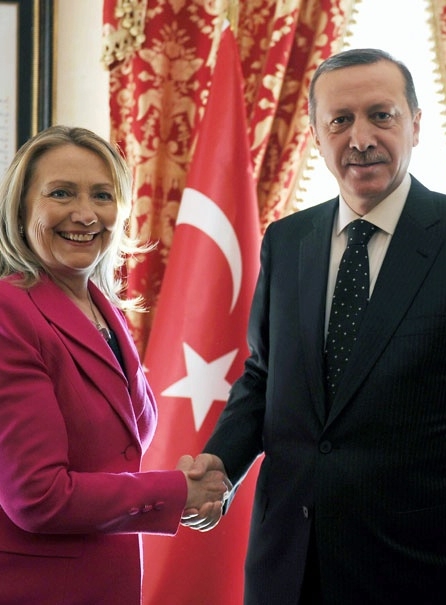 Apparently Turkey has not produced a sufficiently credible threat, and the deployment of 400 US troops manning Patriot missile systems under the NATO flag is meant to give “teeth” to this strategy. It may also be a means to ensure that if an incident is staged, as US Senator John McCain advocates, where in if the Patriots are used to engage Syrian aircraft operating within Syrian borders to create a defacto “no-fly zone,” the presence of US troops will deter a Syrian counter attack and allow the no-fly zone to remain in effect – providing cover for terrorists operating in northern Syria, including the now admitted Al Qaeda faction, Jabhat Al-Nusra. The actual threat Syria poses to Turkish territory is non-existent. Syria gains nothing strategically by attacking Turkey despite numerous intentional provocations. 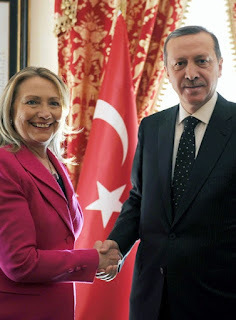 And despite Turkey’s support for intentional terrorists seeking safe haven within its territory, receiving arms, equipment, and cash from NATO, and more specifically the United States CIA, Syria has still successfully ground down these terrorists as they enter and attempt to establish footholds across the country. The placement of Patriot missiles is a necessary escalation for NATO, who is otherwise losing both time and credibility daily. The clock is also ticking for the inevitable collapse of its newly created opposition “coalition,” which is filling the already collapsed footprint of the recently abandoned “Syrian National Council” (SNC). Despite a concerted effort by the Western media to portray the Syrian government as on the perpetual verge of collapse, no precise details have been given of actual terrorist gains. The psychological campaign was heightened when the Western media attempted for several news cycles to claim Russia was abandoning Damascus, another unsubstantiated claim Russia itself has since denied. A force on the verge of real victory does not need to fabricate gains to psychologically diminish the strength of its opponent – real gains, even if embellished, have significantly greater impact. Despite claims made by the Western media – much of what is said by analysts are best guesses. The actual tactical and strategic lay of the battlefield is privy to a select few within Syria, and amongst its adversaries and allies. To make any meaningful impact on the Syrian government’s leadership and supporting factions, real gains will need to be made – gains that have thus far failed to materialize after 2 years of NATO aggression against the nation. Much can be garnered however, by the measures taken by those who do understand the actual strategic and tactical factors at play. The Western media’s repeated attempts to portray the Syrian government as taking increasingly desperate “defensive” measures have turned out to be false, betraying not only the image of weakness the West attempts to project upon Damascus, but betraying the image of strength the West attempts to project upon itself and its proxy forces. As stated many times before, the West has extended itself too far, its credibility and operational capacity is waning by the day. It has no choice but to continue pushing forward in hopes that all before it lacks the fortitude to stand up and fight. An essential component of its strategy is creating division and defections amongst its targeted adversaries while fallaciously multiplying its own forces to expedite an otherwise untenable and unsustainable military campaign. In nations like Vietnam or Afghanistan, where the population absolutely refused to submit to foreign occupation and internal subversion, the West has been repeatedly defeated. The West will not stop until either Syria is divided and destroyed or the West itself crumbles in the midst of its untenable foreign conquest. Image: General Abdul Fattah Younis‘ reward for accepting offers to “power share” with the Libyan rebels was his assassination. Capitulation, division, and defecting are not real options. Furthermore, defection, capitulation, and failure are not options. In Libya, a campaign NATO is attempting to scale up and repeat in Syria, otherwise superior forces folded in the face of psychological operations. A failure to adapt to NATO’s military tactics and a lack of leadership or understanding as to the consequences of losing the country to bands of genocidal terrorists has cost Libya the ultimate price. Syria has shown remarkable resilience in contrast. It must continue to do so. Syria’s fate will be that of Libya, Iraq, Afghanistan, or worse if it falls. Unity is Syria’s only option.